Last week we walked into the Clinic for Developmental Disabilities at Children’s Hospital for the first time in our lives. As we approached the door, the name shouted at me, trying to shatter my heart into a million pieces. It’s never a place I imagined I would be going, where I will likely frequent over the next 15 years of Sophie’s life. 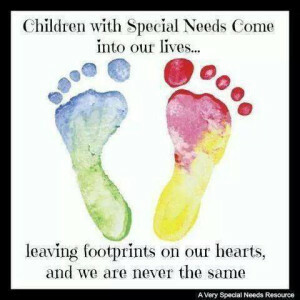 How could it be my child who has a disability? To me, she’s an absolute delight. Of course she is. And then it hits me. Talk about a paradigm shift. A developmental disability of any kind never means that a person is not lovely or is disqualified from any part of God’s good plan. Duh. Right? But here’s the thing about me. I’m an intelligent person, and throughout my life I’ve placed a lot of value and importance on being intelligent. I’m so thankful that God brought me to this place as a mother, this clinic, full of people who are SO immensely valuable, so lovely, with so much to offer, despite physical and mental impairments. Life is no longer about brains, beauty, or brawn. Our society uses those things to measure a person’s value, but God’s economy is different. In His world, we just need to touch others’ lives and spread his glory. We can do that regardless of our abilities or disabilities. Each person whom he has created, he has called valuable, and he has uniquely gifted to impact the world for him. Whatever Sophie’s prognosis turns out to be, she will always be special, loved, and worthy of love, because God said so (and because Mama Bear says so!!). Maybe this seems like a simple truth, but it’s hitting me in a very real way right now in my life. We are so quick to assign value to ourselves and to others based upon all the wrong things. No matter what kind of brokenness a person carries, we treat them as valuable because God has said so. Jesus didn’t come to die for the intelligent, for those who have it all together, for the picture perfect family. From his own mouth he explained that it’s not the healthy who need a doctor, it’s the sick. He often criticized and admonished the religious leaders, the schooled men of his time. Just like me, they were on their high horse and didn’t get it. I’m done on this high horse. I’m done worry about whatever it is that God has for Sophie. My hands are open, and I’m just accepting whatever it is he has for us. No conditions. No fear. To get back to the appointment with the developmental pediatrician, I’ll say I think I’ve found a kindred spirit, as Anne Shirley would say. As I voiced my questions about WSS to her, she reminded me of the wisdom that I have chosen to live by (before she even knew me) in these last four years: We can’t look into the future. From a medical standpoint, it’s not even possible. 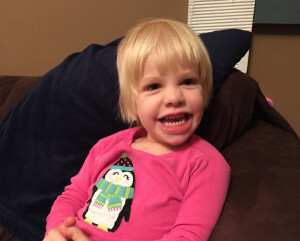 We can’t determine how Sophie’s possible syndrome might affect her in six months or a year or five years. We can’t plot out the roadmap because, within each syndrome, some children are mildly affected while some are profoundly affected. Sophie is doing really well right now, and all I need to do is be ok with right now. I have often said that I just need to be ok with today. It was so good to hear this doctor reiterate that truth to me. Even though she’s not familiar with Weidemann-Steiner Syndrome, I appreciate the wisdom she offered about navigating a potential disability. Even for those who do not walk in my shoes, I realize this is truly what God wants for each of us: To be ok with today; to recognize enough grace for today; to stop worrying, planning, wondering about “then;” just to trust him. Can I be ok with where I am today? Yes. Can I just let him take care of tomorrow? Can I just let him care for those I love? Can I just let him be in control? Yes. Yes. Yes.